Use the form below to inquire about Colonial Portuguese Bungalow At Moira . Use the form below to reserve for Colonial Portuguese Bungalow At Moira . 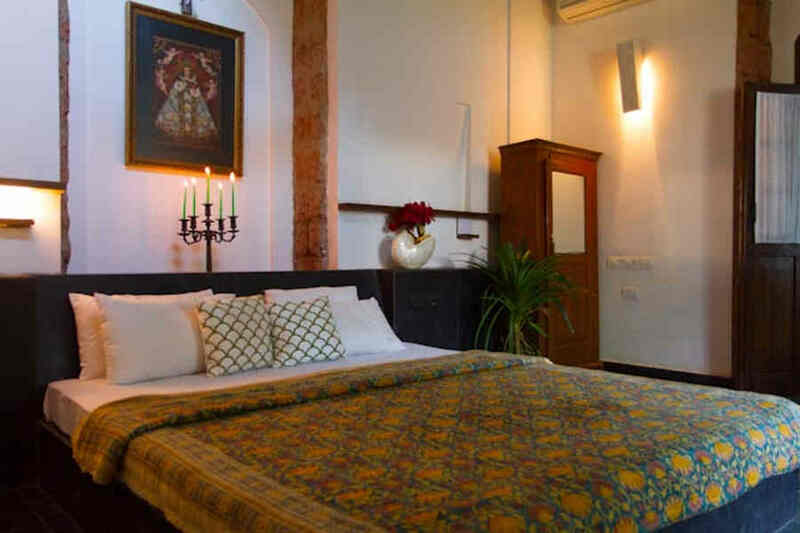 Each of these rooms is distinct, having different style bathrooms and furnishings, and open out to the courtyard. 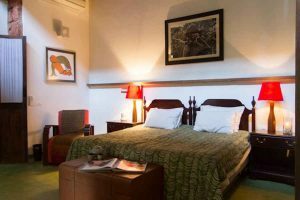 The rooms have double beds and are named after different spices. These are spacious rooms with lofts. The master bedroom and the lofts have double beds, the bathrooms have outdoor showers open to the elements. The entire villa can be booked for a family get-together or function. 16 people can be accommodated. 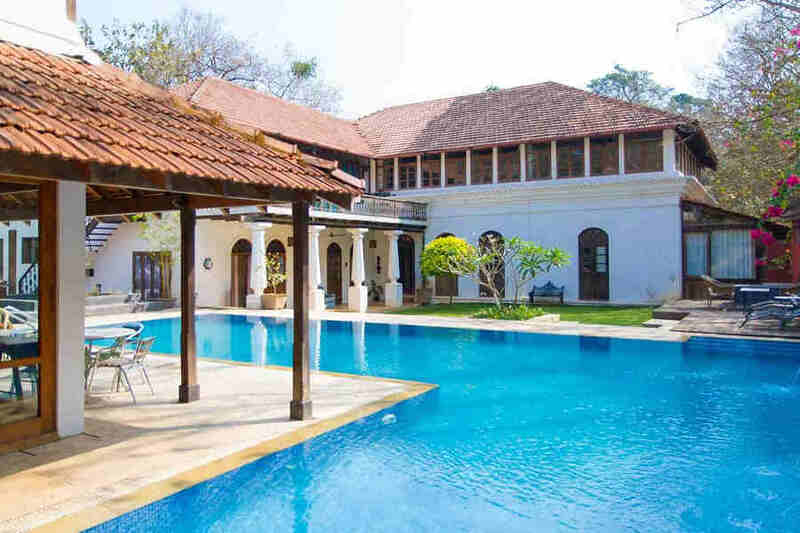 Sample the simple delights of life in Goa at this Colonial Portuguese Bungalow At Moira, tucked away in fruit orchards. 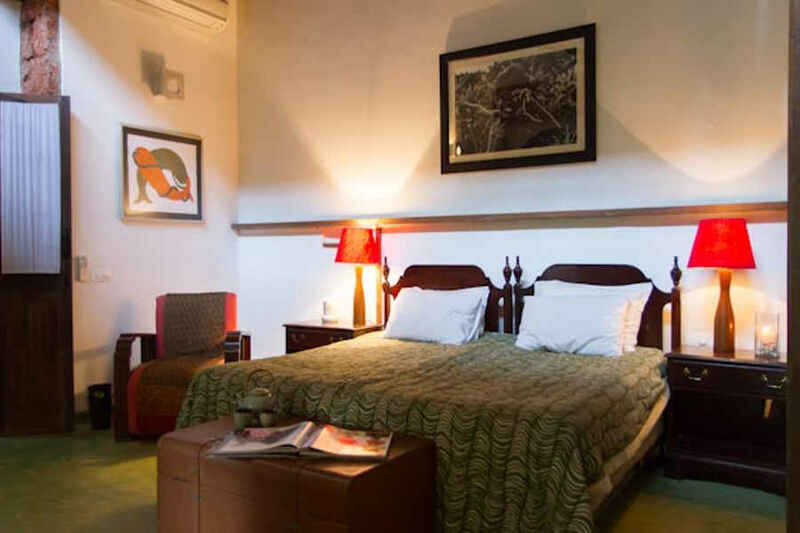 Located in one of Goa’s four heritage villages, this Colonial Portuguese Bungalow At Moira sits at the end of one of the many winding lanes that dot the North Goa area. The popular beaches and markets are all just a short distance away and easily accessible from this bungalow which is away from the hustle and bustle typical of tourist destinations. Built over two centuries ago in 1894, this Colonial Portuguese Bungalow At Moira has pillared verandahs and a soaring roof. 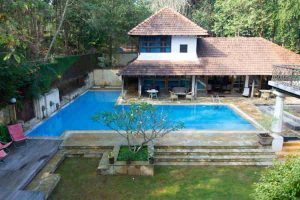 A perfect blend of tradition and modernity, the bungalow has lush gardens, a sparkling swimming pool, a lily pool, and cozy nooks to curl up in. Enjoy delicious meals cooked by a master chef who whips up dishes of your choice. Breakfast is as per a set menu and served in the dining hall each day. Don’t forget to taste some delicious authentic Goan cuisine while here as there is an abundance of seafood and fresh produce available which adds an unique flavor to all meals. A bar lounge with a selection of beverages situated on the property houses a projector and a screen. 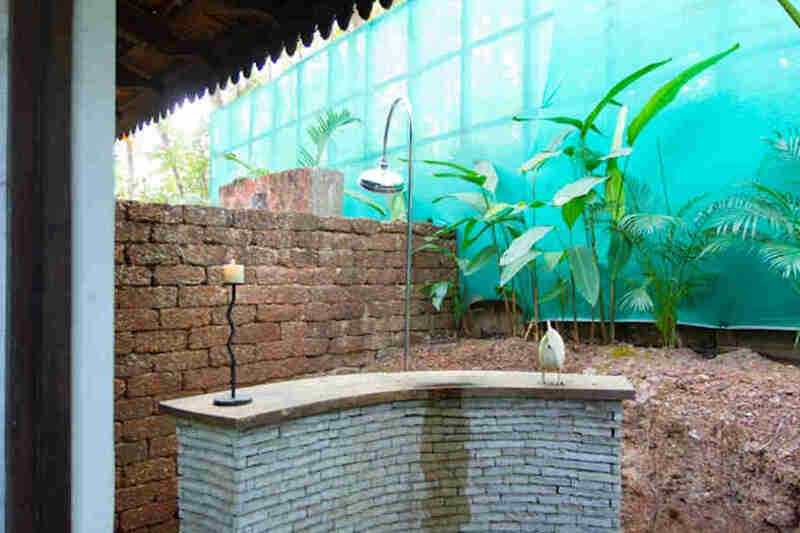 Swimming pool, steam room, and massage room are some facilities available on the property. 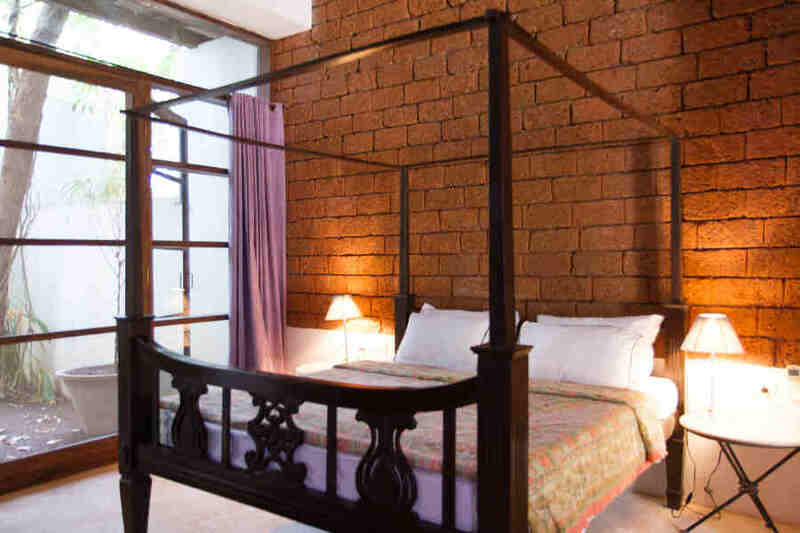 The six air-conditioned suites at the Colonial Portuguese Bungalow At Moira accommodates up to 16 people. 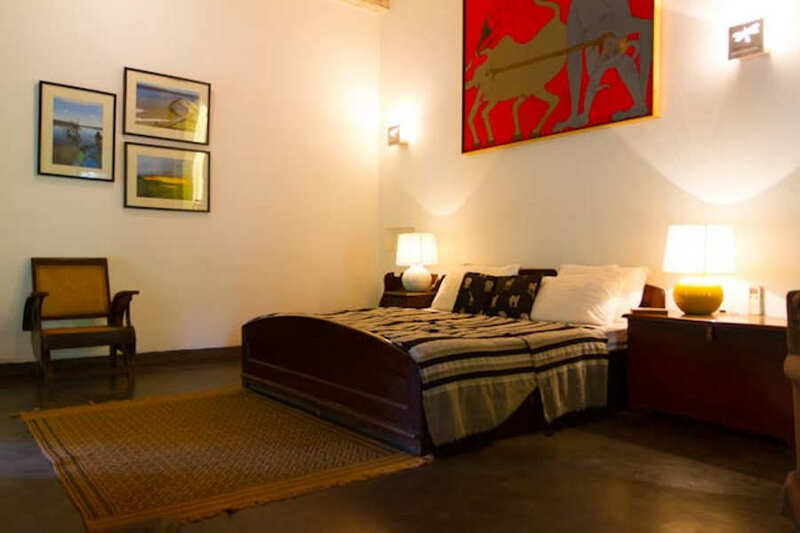 The suites are spacious and comfortably furnished and are named after various spices. 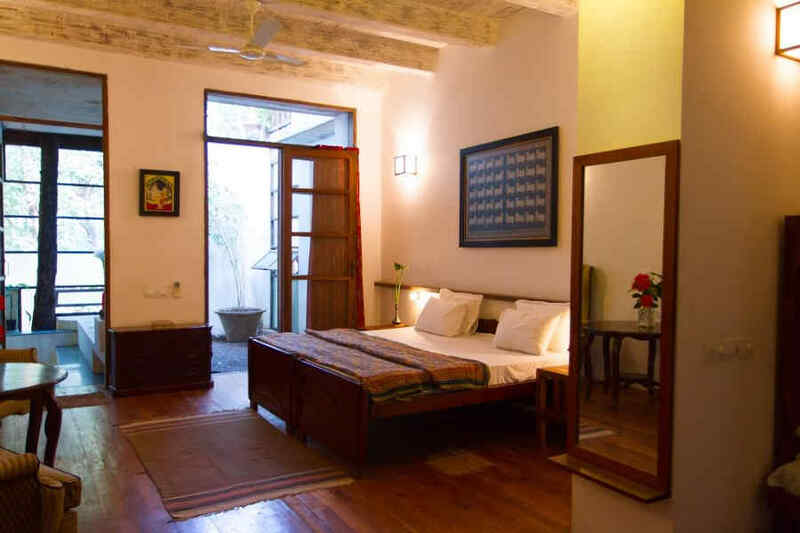 The quaint furniture, cheery bed linen, and wispy curtains complete the picture of serenity that the property paints. Some of the suites have outdoor baths and some are perfect for small families staying together. 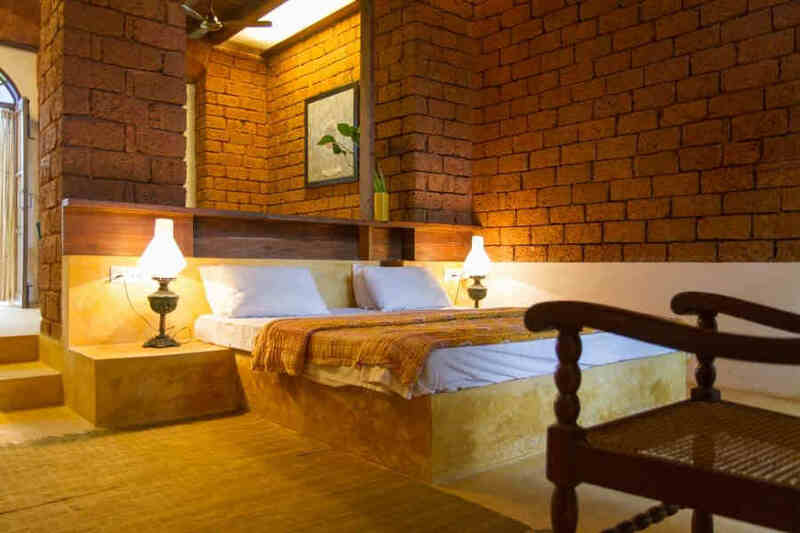 Efforts have been made to bring in nature in some form into each of the suites. The ideal getaway for a dream holiday in Goa! The villa comes with 4 excellent staff. In case the entire villa is booked; guests can discuss menus for each day with the cook. Pre-set meal options are available for individual guests at an additional cost. The staff can organize local cabs at an hour’s notice for trips to the beaches (20 to 40 minutes away) towns or local markets. There is a steam room and a massage room – the staff can work the steam room for you. A nominal charge of Rs.400/- is requested for its use. A masseur/masseuse can be booked by appointment if notice is given in time, especially during season. Guests are requested to adhere to village etiquette and minimize noise levels after 10 pm. Confirmation of booking is subject to availability of rooms/villa and receipt of advance payment. Reservations canceled/amended 30 days prior to check-in shall be exempt from cancellation charges. One night stay on pro-rata basis shall be levied for cancellation / amendment received up to 15 days prior to check-in. There shall be no refunds for “no-shows”, “early check-outs” or cancellations made less than 15 days prior to the check-in date. Go for a languid swim in the pool or lounge with a drink and a book by the poolside. Watch the many colourful species of birds that flit through the trees and perch by the lily pool. If you need some rejuvenation and pampering head for the steam room or massage room. You can also get a picnic lunch packed and set off for the nearest beach. Cycle down the winding lanes of the village or go for a night stroll as the village settles down. You can visit the Church of Our Lady of Miracles which is in nearby Mapusa near the Municipal Gardens. The Saturday Night market near Baga also makes for an interesting trip. Fort Aguada, Anjuna Beach, Calangute Beach, and Baga Beach are some other landmarks. Do not miss out on the chance to experience some water sports when in Goa. The beaches offer adventure activities such as parasailing, windsurfing, scuba diving, and water scooter rides to name a few. Backwater kayaking in the many rivers in the area is another experience that is not to be missed. Thivim railway station at 17 km is the nearest. Vasco da Gama is at a distance of 40 km while Madgaon railway station is 51 km away. Bangalore railway station is 603 km away.